National No-Till Conference – 25th Anniversary – Features Lots of Cover Crop Ed. 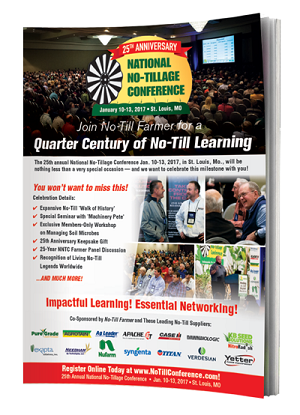 This year’s annual National No-Till Conference – Jan 10 – 13 – in St. Louis is perhaps the best ever. Here’s the link to the website. Click on the image below to see the entire prgram listing. For you cover crop fans, here’s a listing of the speakers, classes and roundtable discussions about cover crops. There are plenty available on each of the three days of the conference. J.C. Cahill – U of Alberta…how plants talk to each other and how knowing that might be important for your farm. Keep more N on your farm – research on how cover crops help N mgmt. How to do it inexpensively ($13/a). Planting 8 – 15 way cover crop cocktail after wheat…and how that could produce a double digit increase in corn and soybean yields while cutting your N application rates in half. Introduction of livestock to help manage large amounts of crop residue. Cover crops, prairie strips, buffers, native grasses, terracing, crop rotation and rotational livestock grazing – protecting soils while building organic matter quickly and boosting profits. Research results from a variety of states. Midwest states: Ohio, Indiana, Illinois, Iowa, Missouri. When does one cover crop – or two or three – make more sense than a cocktail of mixes? How to balance cost with needs? Determine what soils need before making decisions about seed. Slash input costs with improved organic matter, banding fertilizer and cover crops. How to do it effectively and save yourself headaches? How weather, seed varieties, growth states and herbicide choices factor in? Why to avoid the Variety Not Stated (VNS) label? How to track moisture and herbicide applications while making rotation decisions? Impact of cover crops on suppressing weeds and weed seed banks. Cover Crops that Cut Your Fertilizer Bill. Randy McElroy, Sustainability researcher at Monsanto Co.
Transform soil with a variety of tools, including cover crops. This entry was posted in General Information, Soil Quality and tagged Annual ryegrass, cover crops, Dan Towery, erosion control, improve water infiltration, Mike Plumer, no-till agriculture, seeding cover crops. Bookmark the permalink.